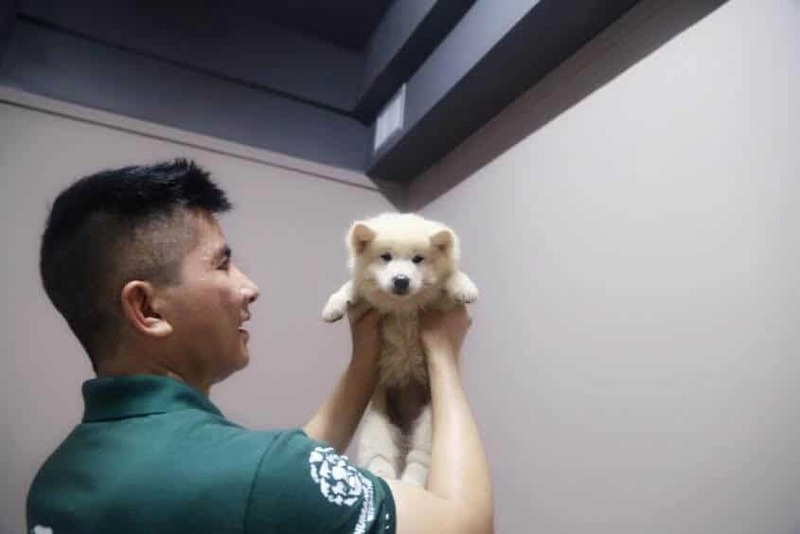 This puppy was fortunate to be rescued just in time from the Yulin bound dog cage. Cruelty, sometimes creeps in and devours humanity from unsuspecting grounds, in the name of religion, customs or profits. How else would you find any logic in Yulin dog meat festival where humans torture and devour their best friends? 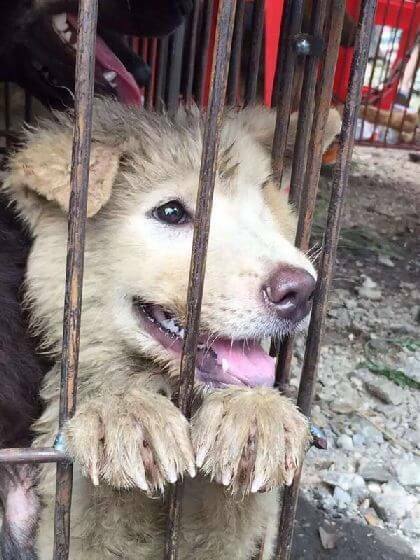 Merely days before China’s annual Yulin Dog Meat Festival, Humane Society International (HSI) along with partners in China, negotiated for the release of 29 frightened dogs and 5 cats, who were being held captive at a slaughter facility in Yulin. These 34 animals were rescued and taken to shelters, where they’re being bathed, fed and cared for. 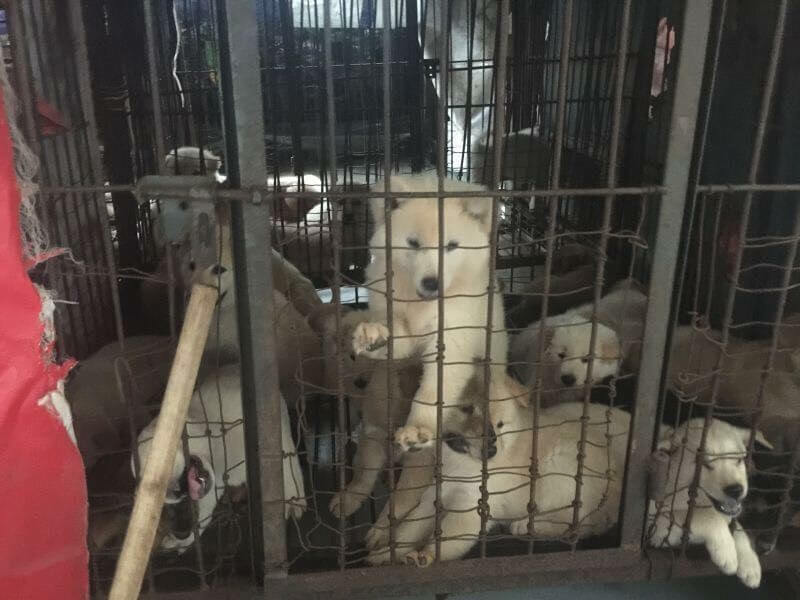 Some of these animals will find loving homes in China, while most will be flown to the U.K. and U.S. to find families there. While China has a history of having dog meat as a dining table delicacy, Yulin dog meat festival is a relatively new tradition, created by an entrepreneurial group of dog meat traders in 2010 to increase sales. This cruel celebration marks the start of the summer solstice for the town of Yulin, located in southwestern China. 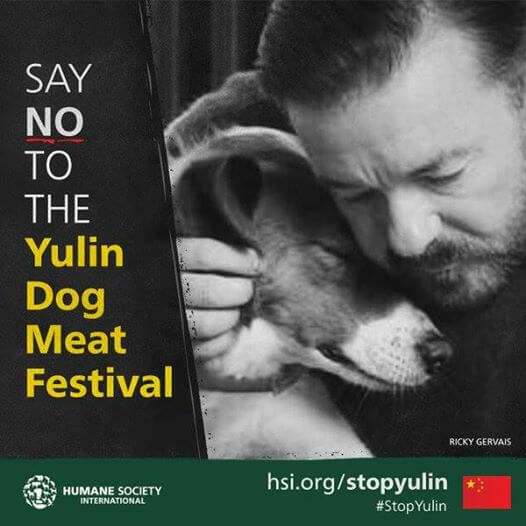 In 2015 alone, 10,000 dogs were killed over the Yulin festival weekend despite the world wide protests led by animal lovers and organisations like Humane Society International (HSI) which worked with local activists to help save hundreds of dogs. Even ghastlier aspect of this so-called festival is the barbaric brutality that is unleashed on the poor animals — at times strangled or boiled alive, due to the belief that such torture makes the meat more tender. What is the Chinese govt. doing to stop The Yulin Dog meat festival? The Yulin dog meat festival, though not promoted by the local government, is a private and spontaneous activity. The Chinese government has never openly accepted the existence of such a festival or taken measures to curb it. This year, however, the government has formally pledged towards shutting down the festival. Despite national and international protests and a petition with more than 11 million signatures, the Yulin Festival is set to begin on Tuesday, June 21. The Chinese officials have confiscated dog and cats from Yulin bound trucks, and have shut down local slaughterhouses. We hope the announcements pertaining to new animal welfare laws in China would be critical to curb and eventually end the event permanently. Unlike Chi Chi, the dog who lost all her paws in the dog meat industry in South Korea but was later rescued and adopted, not all dogs in the meat trade are so fortunate to survive. Donate money and/or time to the organizations working to end the dog meat trade, including HSI, AHWF and Soi Dog. Here’s hoping Yulin realizes that festivities shouldn’t mean torture and death, how about taking a cue from these wonderful festivals from around the world where dogs are celebrated and not cooked. Update: Dog meat gets banned (temporarily) from the Yulin Festival in China. The ban will come into effect on June 15 – a week before the start of the infamous festival. The ban will prohibit the sale of dog meat at restaurants, markets, and street vendors. Those who don’t obey will be facing a fine of up to 100,000 yuan (nearly $15,000) and arrest. 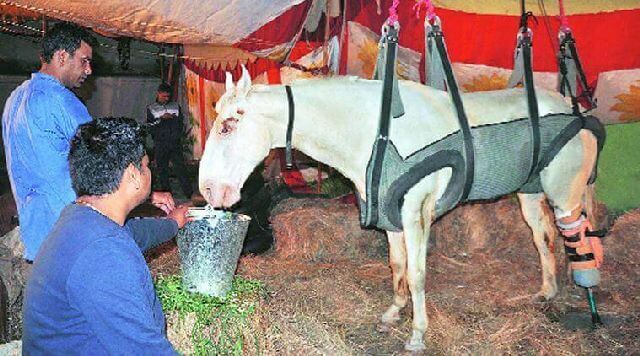 RIP Shaktiman ― No Country for horses, hounds & humans? 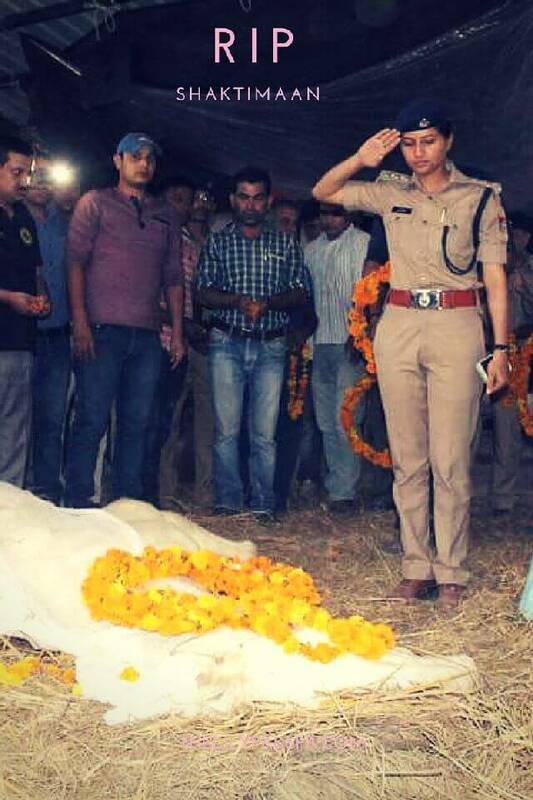 Police horse ‘Shaktiman’ who was injured during a BJP protest in Dehradun, died on April 20, 2016. Lost to man’s wicked wars, the humanity, horses and hounds have all suffered collateral damages since early days and yet the abject cruelty refuses to wither. 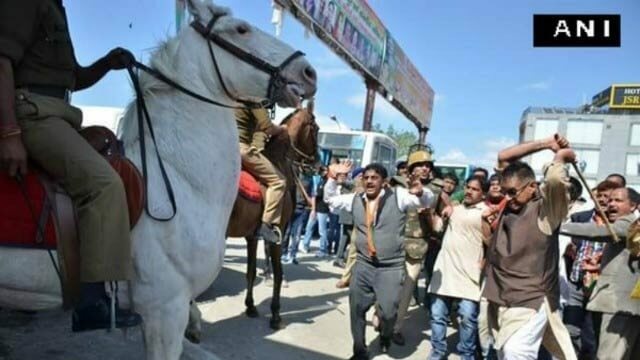 In the otherwise pristine hill state of Uttarakhand, the shocking incident of a police horse being severely attacked by protesters was caught on video tape ― On March 14, during a protest march of the Bhartiya Janta Party(BJP) in Dehradun, BJP MLA Ganesh Joshi had allegedly attacked the police horse Shaktiman, who was deployed with the mounted police in Dehradun. Shaktiman suffered multiple fractures in his hind leg during the protest and had to undergo amputation to stop the spread of gangrene. He was also provided with a prosthetic limb, thanks to the efforts of Jamie Vaughan who runs a US-based vet care NGO in Bhutan. Unfortunately, the poor horse couldn’t survive. How does attacking an innocent animal prove your point against the government or the system? Soon after the video of the incident spread across media outlets, the public outcry led to the arrest of the BJP MLA Ganesh Joshi (now out on bail). Jamie Vaughan, who runs a US-based NGO working for veterinary care in Bhutan, arranged for an artificial limb for Shaktiman from a US-based manufacturing firm. Dog with Blog stands along-with the hoards of people across country who demand that stringent punishment is handed to the callous offender(s). Posted on April 21, 2016 April 22, 2016 Author Abhishek JoshiCategories Grrrr.....3 Comments on RIP Shaktiman ― No Country for horses, hounds & humans?